cold,dry and sunny in west hull,very slight snow flurry at about 11 this morning,lasted about 5 mins. Tomorrow seems like a radar watching event. If we get more than drizzle then it looks like snow but automated forecasts differ heavily on whether anything will fall and how much. Gfs6z in its wisdom has snow here from monday night to wednesday morning. 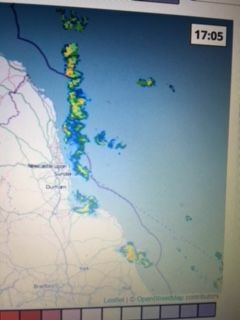 i wonder if this nice line of showers might make it inland this evening perhaps ? 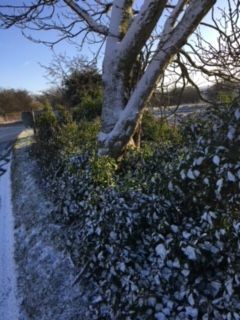 Just a dusting here but it managed to survive in the shade which was surprising. Local forecast has sleet for here tomorrow night lasting into early Saturday then dull and dry. A bit of light snow for Tuesday at the moment. Netweather forecast has sleet from mid afternoon turning to light rain during Saturday into Sunday. Beeb Forecast Sleet late FRiday in Saturday morning then dry until Tuesday when there will be light snow. Had quite a bit of wet snow on the coast. Coming home past Filey around 5.30pm roads were very slushy, and of course it had to be the day I was towing a trailer with some wood to be converted into firewood. Took it steady but some people seemed to have completely lost their bottle coming up the hill to the Dotterill pub, slowed right down and then lost traction on a straight wide road. All the snow seems to have gone now. Had a look at the meto forecast for LBA and its showing light snow with several hours of heavy snow. The GFS is also showing a much more significant pulse of precipitation pushing through so could be something of interest. Is it time to declare Winter 2018/2019 finally open?! Looking cold and potentially quite snowy particularly from early next week onwards. Might even be a little surprise tomorrow evening as an appetiser?! A nice minus 1 here this Morning hopeful of a Surprise later on today regarding the snow fall. Looking great into next week for some long awaited snow chances. Good luck to all and can’t wait to see the Snow pictures start coming in soon. Might want to keep a radar page open today. Radar is showing the band is heavier than forecast, with the heaviest possibly heading our way. Could mean a few cm's is possible. I think Pennine areas such as your location should do fairly well but I am fully expecting the front to break up and fizzle out as it tries to cross the Pennines. Mornin all. And a nice crispy -3c start to the day and my pick of the bunch is this possible snow machine for us guys, still all on IMHO. Front looks okay at the moment, I am hoping that west and South Yorkshire benefit from uplift over the Pennines. Sadly have to work so can’t monitor too closely but it’s worth saying that the relatively active bit of the front is gaining latitude as it moves slowly west so I don’t think we are at risk of it not arriving unless it properly falls apart. System is due to arrive around Leeds and Sheffield between 2-4 and automated forecasts are sleet or snow. This won’t be a memorable event but for those of us near the Pennines I am hopeful that we will at least see snow fall if not get a dusting... though knowing our luck it will be very cold rain. Yellow warning for Bradford, Halifax and Huddersfield but not Leeds or Wakefield. ok so in the mod thread they all seem pretty excited again...But noticing all the talk about the south getting a battering? Would that be the case? As i would rather there be no snow at all in the uk than the southerners getting it all! I wouldn’t really worry about the snow for now if you get the Easterly feed the North Sea is like a snow machine so showers will push inland on a strong flow. Get the cold here first and worry about the snow after that’s my view after been following along for years. 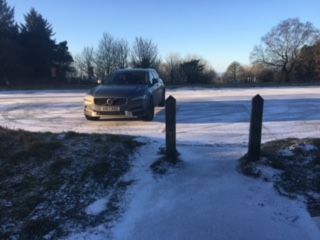 Snow to sea level in Merseyside. That is very strange, we have a yellow warning of snow for Sheffield from 1pm. Light snow here blowing in the wind. Front is arriving in Sheffield and Bradford more or less now according to radar and is in better shape than expected.